Last September, the Chicago Teachers’ Pension Fund trustees voted to follow the recommendation of their actuary and reduce the fund’s expected rate of return on investment to 7.75% from 8.0%. As noted in this blog post from last fall, many State and Chicago area funds have also recently reduced their expected investment returns. The assumed rate of return on investment, also called the discount rate, is used to calculate the present value of the future obligations of the systems. Reducing the rate increases the present value of future commitments to employees and retirees and results in higher liabilities and lower funded ratios. At the Chicago Board of Education meeting on Wednesday, February 26th, CPS CEO Barbara Byrd-Bennett said the District’s FY2015 contribution will now be $84 million higher than the FY2014 payment, adding to CPS’ FY2015 budget deficit. 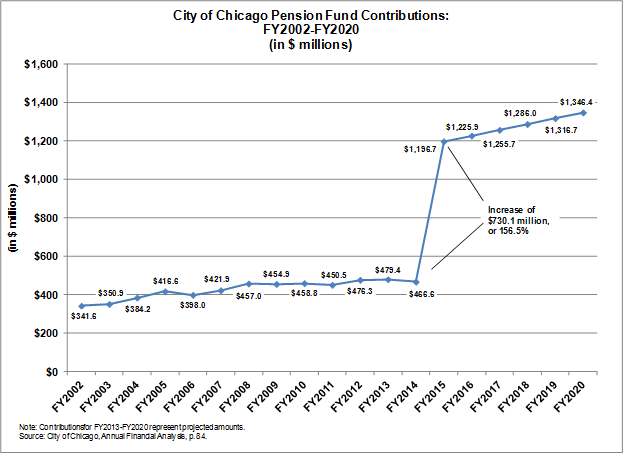 The District’s limited ability to raise property taxes, the fact that its fund balance will be significantly depleted by June 2014 and ongoing increases in its operating expenses, especially pensions, all highlight the need for reform of Chicago teachers’ pensions. At the Board meeting CEO Byrd-Bennett also noted that if the General Assembly enacted the same pension reform provisions for Chicago teachers’ pensions that were passed in December 2013 for the downstate teachers’ pension fund, the District’s FY2014 contribution would have been reduced by $250 million. Clearly, pension reform alone will not close the District’s deficit. However, it is a necessary component to a plan to put the District on a more sustainable financial path. I don’t want to get into return assumptions right now. Changing the return assumptions does not change the actual costs of the pensions, but that is a discussion for another day. 1. The actuarial present value of beneﬁt payments projected to be made in future periods in which (a) the amount of the pension plan’s ﬁduciary net position is projected (under the requirements of Statement 68) to be greater than the beneﬁt payments that are projected to be made in that period and (b) pension plan assets up to that point are expected to be invested using a strategy to achieve the long-term expected rate of return, calculated using the long-term expected rate of return on pension plan investments. 2. The actuarial present value of projected beneﬁt payments not included in (1), calculated using the municipal bond rate. Let me unpack that for you: this standard for governmental accounting is a compromise position. Many governmental entities would have loved to be able to keep their precious 8% discount rates. That makes the future benefits look a lot less expensive than, say, when they discount at, say, 4.5%. So what they do is they let a portion of the benefits be discounted at that magically high rate, and then the part that’s not covered has to be discounted at a muni index rate. I don’t know which index, specifically, they’re using, but this gives you a flavor of muni rates and you’ll understand why I specifically mentioned 4.5%. But don’t worry, Chicago – you don’t have to discount everything at 4.5%. Just that uncovered portion which will all of a sudden look a hell of a lot bigger than before. Oh, and when does this new standard go into effect? 136. The requirements of this Statement are effective for ﬁnancial statements for ﬁscal years beginning after June 15, 2014. Earlier application is encouraged. So you can see why there’s some desperation to do something, anything, right now. I will get into the proposed deal tomorrow. Just wanted to set the stage for the very bad place Rahm finds himself in and why Daley left (no idiot he, Rahm – I’m still open on the issue). Chicago pensions will be cut. It’s just a matter of how and when. And it couldn’t happen to a nicer guy.